Oh boy! We enjoyed licking it, and I served this as a dessert when our friends came over. My friend’s daughter liked it very much, and she packed some too. For Froyo, we use frozen fruits and serve them after about 30 minutes of freezing. It’s not completely frozen but at the same time, it’s not liquid too. Froyos are mostly semi-solid. But these barks are frozen more like Popsicle. To be honest, the sky is the limit, with just fruits and yogurt you can prepare zillion frozen recipes. So folks, back to this recipe now. Make this in bulk and freeze in Ziplocs. 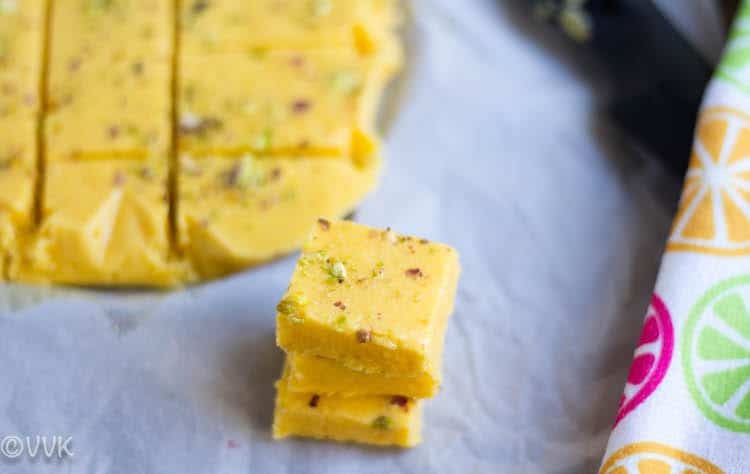 Be it fall or winter or spring; you can relish these lassi bars anytime. 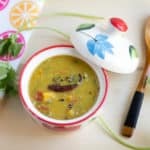 All you have to do is scoop out mango pulp and puree them and then blend it along with yogurt and your favorite condiments. I just added cardamom powder. Then pour them on cake pan lined with parchment paper and freeze them. After about 3 hours, when they are in the semi-freeze state, chop them into a square and freeze it again. Enjoy those squares any time and any day. Isn’t that simple? 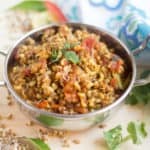 By the way, you can find a lot of other simple recipes in my Recipes section here. Peel the mango and chop the pulp and puree the same. I used one ripe mango. Set aside about 1 cup of the puree. 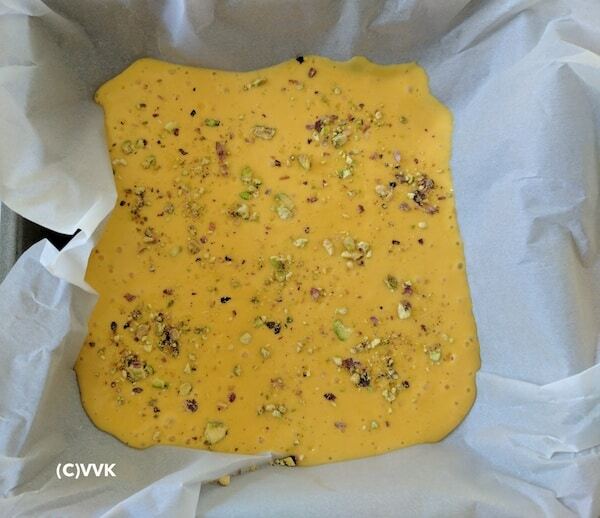 Line a cake pan or baking tray with parchment paper. I lined my square cake pan with the parchment paper. In a blender, add the puree, yogurt, cardamom powder and sugar. Blend it once in the pulse mode or instead of blending you can use the hand whisk and combine them well. And make sure the sugar is dissolved. Now pour this mix into the cake pan lined with parchment paper. Tap it nicely to the mix until it is evenly spread. Next, sprinkle the crushed nuts on top and freeze it. Finally, after about 3 hours, chop them into your favorite shapes and freeze them again. Or after you cut, you can remove the bars from the parchment paper and store them in Ziploc and freeze it again too. This saves space in your freezer. That’s it. 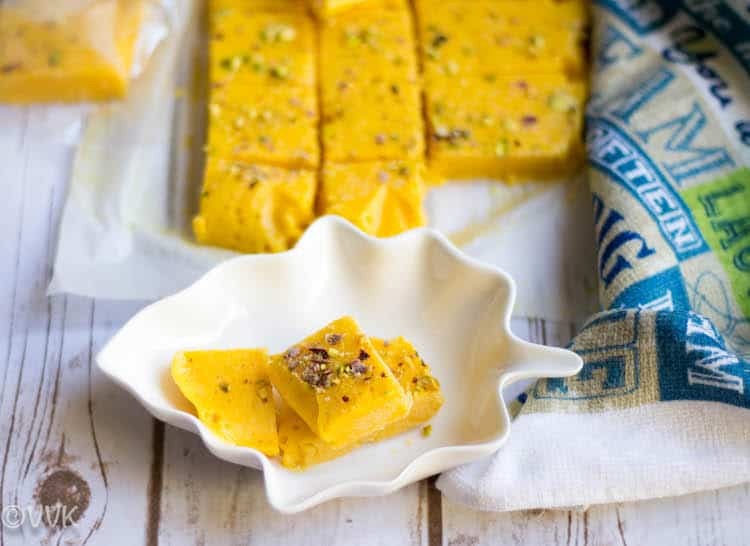 Frozen mango bars are ready! Grab it! Lick it and Relish it! I just went with cardamom powder. 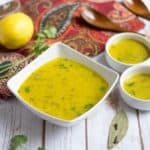 But you can add saffron or rose syrup or along with mango you can add other fruits. Instead of crushed nuts, you can use berries as a topping they taste delicious with mango yogurt combo. We tried that later but didn’t click pics. Adjust the sugar according to the sweetness of mango. Peel the mango and chop the pulp and puree the same. Line a can pan or baking tray with parchment paper. I lined my square cake pan with the parchment paper. Blend it once in the pulse mode or instead of blending you can use the hand whisk and combine them well. Make sure the sugar is dissolved. Now pour this mix into the cake pan lined with parchment paper. Tap it nicely to the mix is evenly spread. Sprinkle the crushed nuts on top and freeze it. After about 3 hours, chop them into your favorite shapes and freeze them again. Or after you cut, you can remove the bars from the parchment paper and store them in Ziploc and freeze it again too. This saves space in your freezer. That’s it. 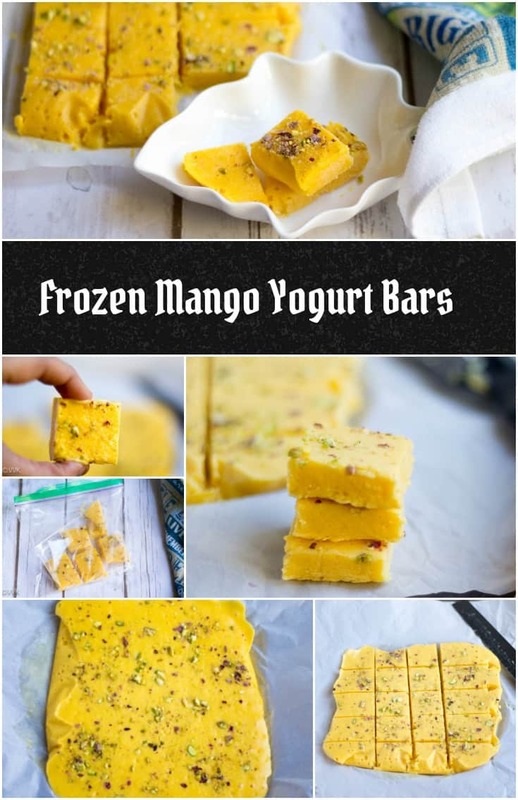 Frozen mango bars are ready! Grab it! Slurp it and Relish it! 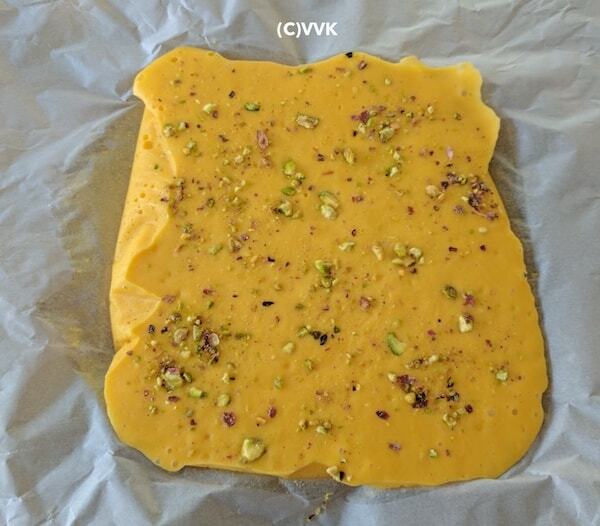 OMG vidhya, this looks amazing yaar, i first though some halwa by looking at the picture, love the idea girl!!! I m going to try this soon!!! 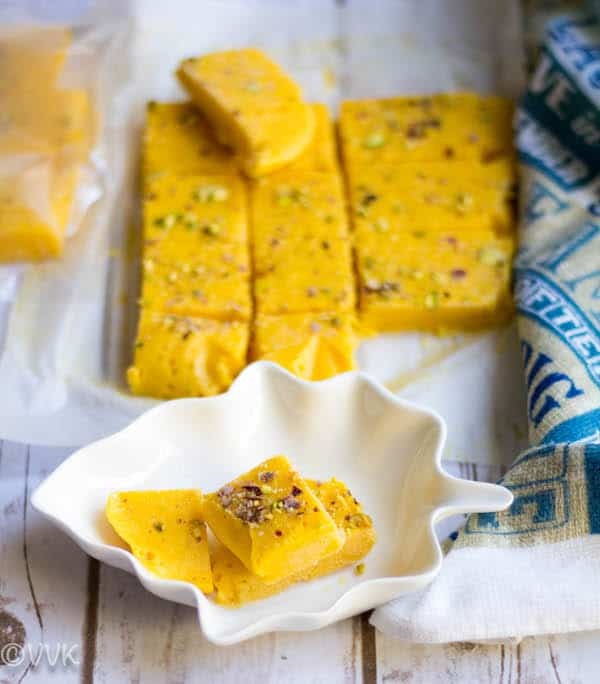 That is an awesome idea to make mango lassi bars. They looks so sinful. 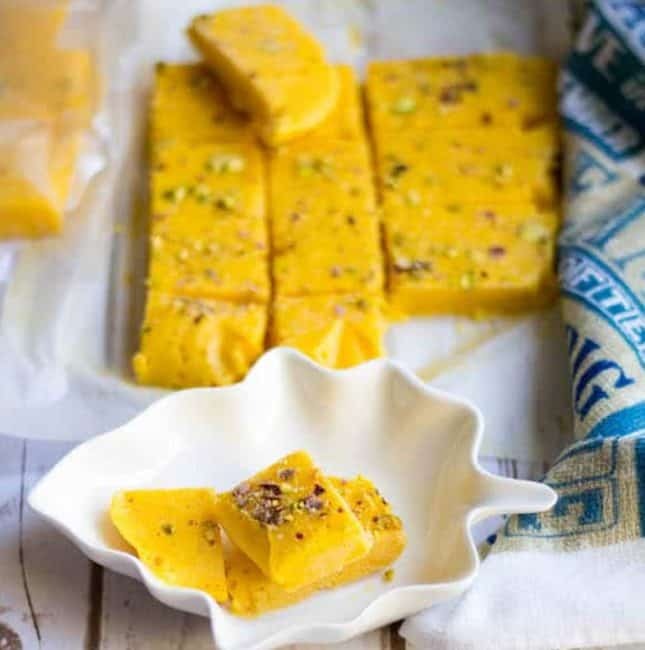 love the colour of the frozen mango yogurt bars and what a wonderful way to enjoy mango dessert even after the mango season is over. :-) Yes very true. Thanks Mayuri. 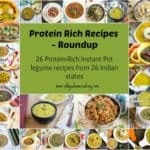 Lovely recipe.. love the cubes idea. Easy to carry. :-) Thanks. Please do try. Fantastic idea ! 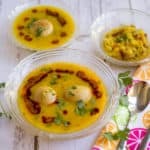 I am a great fan of mangoes , and this is an amazing dessert , super pick. 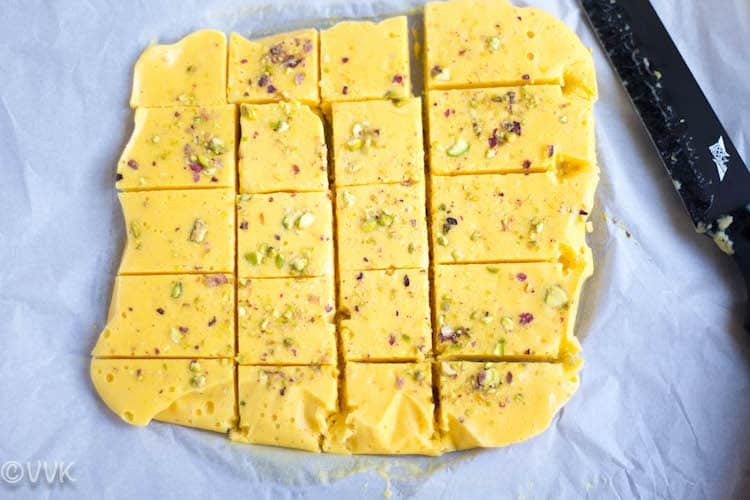 Omg, those yogurt bars looks absolutely irresistible, fantastic post Vidhya, cant wait to make some soon. These frozen bars look so good. Infact they look like pedas. 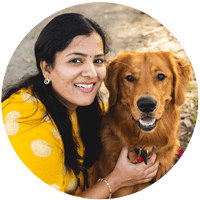 Awesome..
Now that’s an awesome idea Srividya…though I remember reading something similar, trust me I would never have remembered it right away!..your squares look like mango pedas..:0)…very nicely done and yes will check out next year for the lassi!